The purpose of this post is NOT to tell you that Ken Wilber views the world with integral awareness. 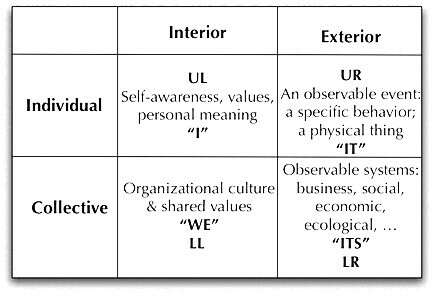 Nor is it intended to discuss Wilber's notion that everything we know, on this planet, can be placed in one of four categories, or quadrants. What it IS intended to do is describe the function of the Integral Content Curator. This unique curator locates and provides content from all four quadrants. Integral content is information curated by humans who approach life from an integral perspective. Integral content varies widely in scope. Themes come and go, memes appear and disappear, questions are asked and lessons are learned. Internal spiritual exploration is valued as highly as new tech gadgets. Our innate human morality is required to keep developmental pace with the exponential growth in new networks of connections in the smart phone age. Integral content is not grouped by any one theme. This content is collected and shared for the purpose of recognizing and experiencing the balance required of the four quadrants in our daily lives. A Curator of Integrated Content recognizes and respects all four categories. Since our life arises in, and as, all four quadrants we can interact and engage integrated content with more balance and awareness.